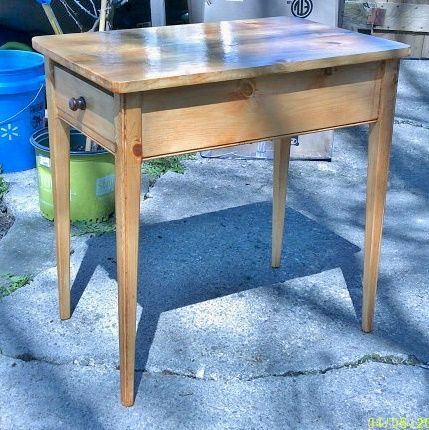 I’m getting started on a Shaker inspired writing desk and have a question about the leg tapers. Originally I seemed to recall that the tapers were only on the inside faces of each leg (2 faces, the ones with the joinery). Since I started doing my research/planning, I’ve seen a few instances where people tapered all for faces of each leg. Is one more common than the other? I’m planning on the legs being 1.5” square and was thinking of tapering the inside 2 faces of each leg down to 1” or maybe even 3/4” of an inch. So my vote is inside taper. P.S. I recall a project on here where the LJ had put the taper on the outside two faces of the legs only. I commented that I thought he had it backwards, but he sent me a link to the original piece that was cut that way. I was definitely wrong, but I still think it looked very odd. For a desk, if you are going to have long legs, I definitely would only do inside taper. I guess for short legs say 6” 4 sided taper would look better. I ve seen both too, but I find the four-sided taper looks odd. I’ve seen a few designs I really like with the taper on the outside, but the leg is upside down(traditionally speaking). Definitely not shaker though. I think there are styles with outside tapers but they are usually round or bowed, not Shaker style. 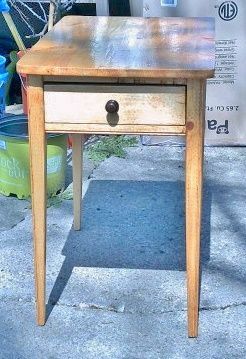 Mom had a round table with tapered legs, black laquer, with marble top. Thanks for the feedback! 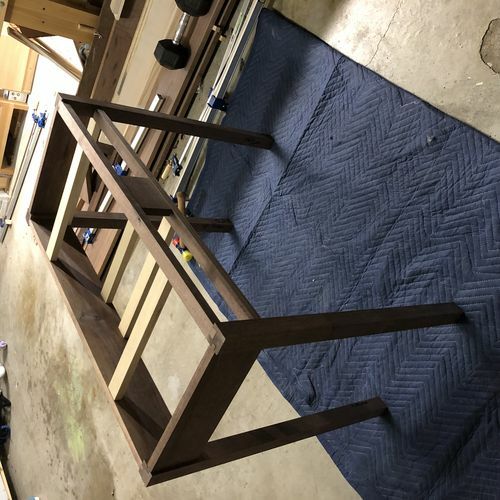 On a somewhat related topic – the desk/vanity I’m building is relatively small – 38” long by 18” deep. I’m planning on 1.5” square legs. 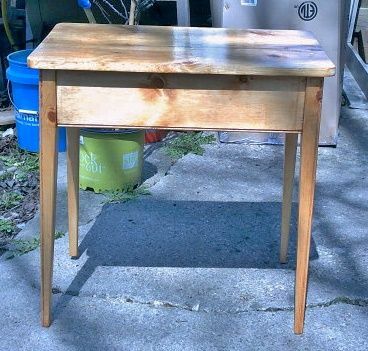 I’ve seen anywhere from 1 1/8” legs for small side tables to 1 3/4” legs for larger desks. I assume 1.5” is a good middle ground? How tall are your aprons going to be? What reveal are you looking at between the top and base? I was planning on 4.5” aprons for an overall drawer height of 3” (2.5” deep after accounting for bottom). Not sure I understand what you mean about reveal between top and base? If I understand correctly, I was planning on a 1” overhang of the top on all sides. Yes, the overhang was what I meant. I think you have a good overall ratio for your piece. Nice and light. Keep us posted. I’m sure it’s going to be awesome. Yes, the overhang was what I meant. I think you have a good overall ratio for your piece. Nice and light. Keep us posted. I m sure it s going to be awesome. That’s about it, though I’m planning two drawers on the long side of the table. How tall are your aprons? I was thinking an overall height of 30” and an apron of 4.5” high. Aprons are 5-3/8” wide….used a 1×6..